Along with this, the use of the new API becomes necessary, and the following permission is necessary on Android 6.0 or higher. [Phone] Since the terminal ID is necessary when using the API, use authority only for terminal ID acquisition. [Permit usage status] It is necessary to use API. RECEIVE_BOOT_COMPLETED: Allows an application to receive the ACTION_BOOT_COMPLETED that is broadcast after the system finishes booting. If you don't request this permission, you will not receive the broadcast at that time. Though holding this permission does not have any security implications, it can have a negative impact on the user experience by increasing the amount of time it takes the system to start and allowing applications to have themselves running without the user being aware of them. As such, you must explicitly declare your use of this facility to make that visible to the user. SYSTEM_ALERT_WINDOW: Allows an app to create windows using the type TYPE_SYSTEM_ALERT, shown on top of all other apps. Very few apps should use this permission; these windows are intended for system-level interaction with the user. 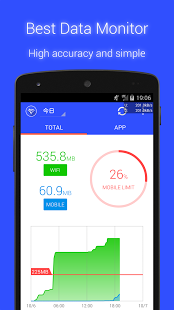 We are releasing an app that measures data transmission!